In late 2014, Gartner used the term “battlefield” to describe the struggle for market share based on customer experience. In a new research study, 89 percent of companies surveyed by Gartner expected to stay competitive in the coming two years on the basis of outstanding customer service, more than any other factor. And it’s no wonder. Driven by high expectations for customer service set by big online retailers, customers increasingly expect every firm to provide them with a similarly excellent experience. Are you ready to rise to the challenge so you can win customers and keep them coming back? 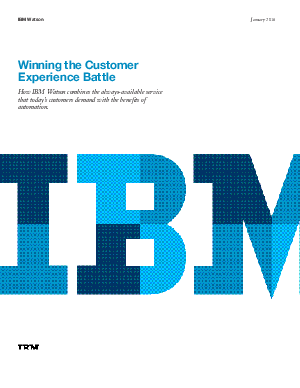 Cognitive technology can make all the difference in winning the customer service battle.